With the new iPad 3/iPad Air in hand and do you want to copy children’s movies to the iPad from Windows or Mac computer easily? If so, this article will give you a simply way. Though competition has stiffened with the growing quality of Android tablets, the Apple iPad still reigns supreme. The unbeatable high resolution and fast performance make it an incredibly versatile device. When you get down to it, one of our favorite uses for the tablet is media consumption, but have you been in the same dilemma below? As the customer mentioned, if the videos compatible with iPad 3/iPad Air (iPad supports H.264, MPEG-4 videos in .m4v, mp4, and .mov file formats), you could easily add them to your iTunes library and then sync to your iPad. However, due to iPad does not support play DVD or Blu-ray movies directly and the formats are beyond the support format, which confused my people want to view Blu-ray and DVD movies on iPad. Don’t worry. Pavtube BDMagic is just designed to solve the problem. It is capable of backing up BD/DVD Disc content to local computer or external devices like Apple, Samsung, and so on. The conversion speed is high and output video quality is great. If you are a Mac user, please go to Pavtube BDMagic for Mac. Now get the Blu-ray/DVD converter and no longer be bothered by the format limitation! How to convert children’s movies to iPad 3/iPad Air friendly format? Step 1. After downloading, install and run the movie to iPad 3/iPad Air converter. Click “Load Files” icon to load the movies you want to convert. The added movies can be previewed in the preview pane on the right of the main interface. Step 2. 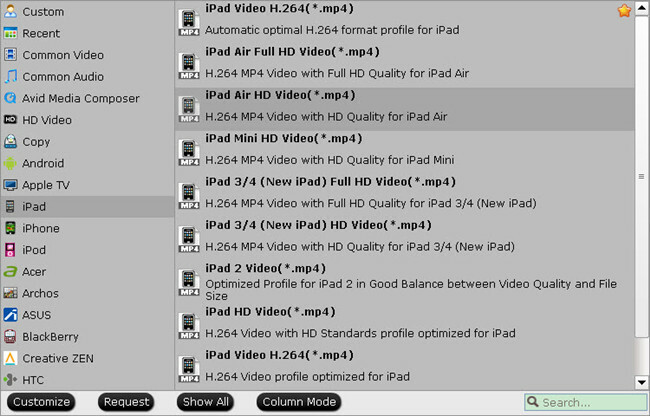 Select “iPad” under Format > iPad 3/4 (New iPad) Full HD Video(*.mp4) as output format. The software has preset the video settings for you. If you want to customize the video parameters, you can click “Settings” to change the video bitrate, frame rate, etc. Step 3. Click the “Convert” button and the video converter will automatically convert your movies to iPad supported videos. After the conversion, click “Open” to locate the converted iPad friendly videos. 2. Under the device, you have an option called Movies. Select this. (If you’ve got videos on the iPad already, they’ll be shown as a list). 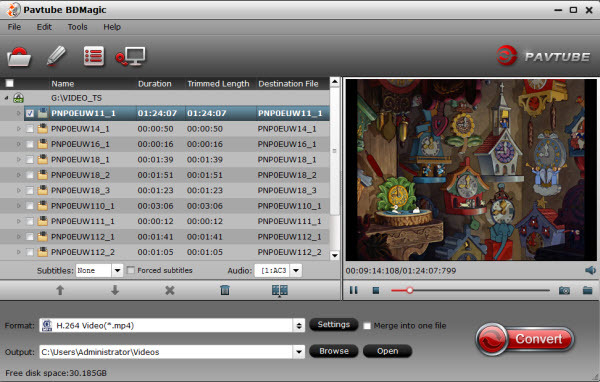 Then drag and drop the video files that you want to copy. You should see a progress bar that will indicate how long it will take to copy the file. When everything is done, you could view the new released children movies on your iPad 3/iPad Air with your children in your car or everywhere you want.